Delta were well known in America for their range of metal and woodworking machine tools. The original manufacturers of the metal-turning lathe line were Rockwell International but, in 1984, their machinery and tool operations were purchased by Pentair Incorporated of St. Paul, Minnesota - a company now known as Delta International Machinery Corporation, with headquarters in Pittsburgh, Pennsylvania; unfortunately, they no longer make either metal or wood-turning lathes. Smallest of the metal-turning machine in the Company's range, the 10-inch (illustrated below) was available with either 24" or 36" between centres and fitted with a mechanical, infinitely-variable speed drive, driven by Rockwell's own 0.75 hp 1-phase or 3-phase motor, to give speeds between 50 and 1500 rpm. 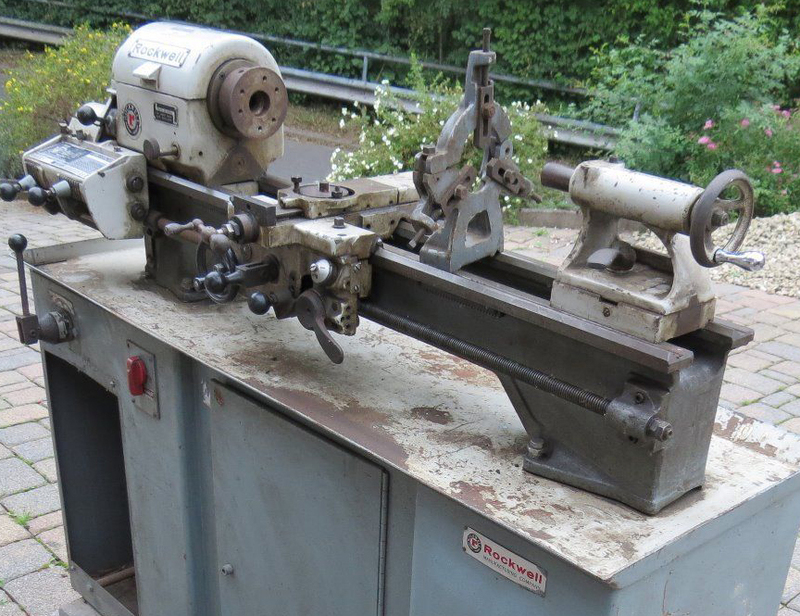 The expanding and contracting pulleys were mounted either underneath inside the cabinet stand or behind the headstock on the bench, whilst the final drive to the spindle was by twin A"A" section V-belts; a very similar arrangement was used on the English Raglan lathe. On the bench-mounted machine speed-control was built in with a handwheel, positioned neatly and conveniently just below the screwcutting gearbox, that could be locked into a speed range, selected by the operator, with pre-set upper and lower limits - a safety feature which had a particular appeal to those responsible for equipping or running a training workshop frequented by forgetful or ham-fisted teenagers. On lathes fitted to the maker's stand speed control was by a long lever, a sticker warning against straining the mechanism by trying to operate it when the motor was not running. Particularly well-engineered, the headstock held a heat-treated and ground spindle with a bore of 15/16" and a (4C) collet capacity of 3/4". 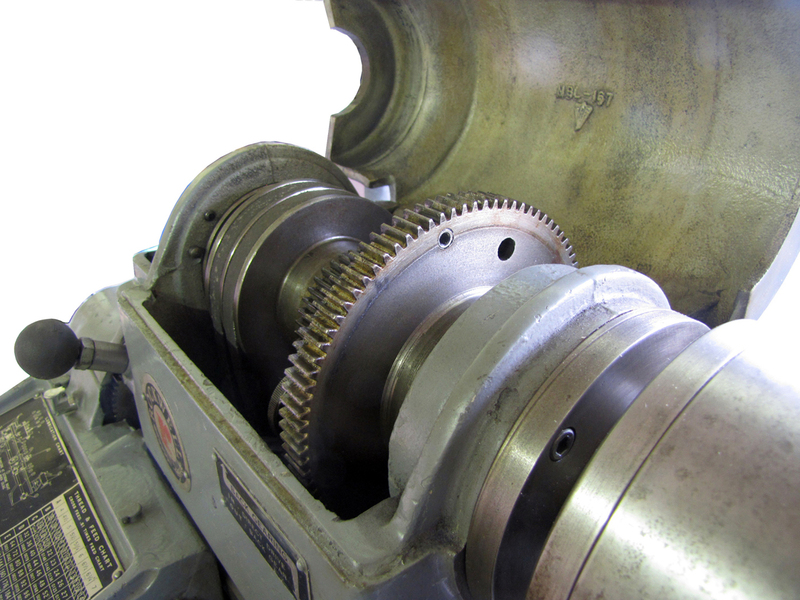 It ran in a large, double-row angular-contact, pre-loaded precision ball bearing at the spindle nose end and a "floating" bearing at the outboard end designed to compensate for spindle expansion as the machine warmed to its task. According to the sales literature the spindle was bored with a No. 9 Brown and Sharpe (B & S) taper and fitted with a short, hardened bush to take a No. 2 Morse taper centre. However, it is possible that later lathes may have been modified in this respect and the nose bored to the more common Morse standard. The ground-finished spindle thread was 11/2" x 8 t.p.i. A full screwcutting gearbox with 54 English threads from 4 to 224 t.p.i was fitted as standard, as was power cross feed. 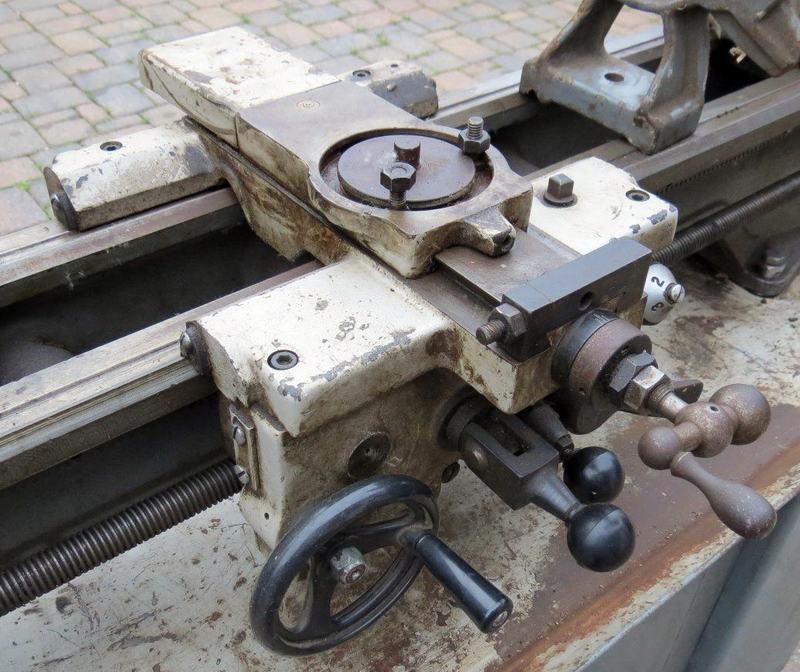 The latter was provide with an adjustable clutch, operated by an "over-centre" lever in the middle of the apron, and could be adjusted (whilst working) from a light setting designed to slip and protect the lathe to one where all the cutting force available was fully utilised. 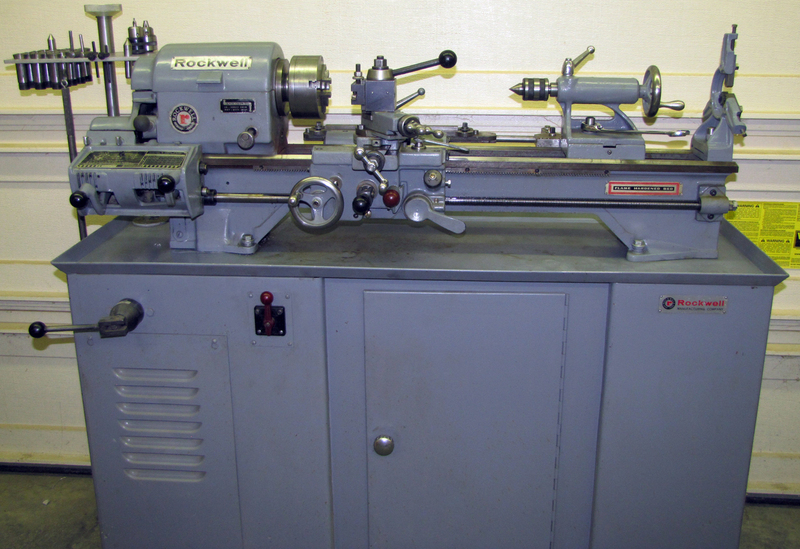 Two larger Rockwell/Delta lathes were also manufactured: the 11-inch and splendid, well-specified 14-inch. A repaired bull wheel: found stripped, the remains of the original teeth were turned off and a new ring of them pressed into place and mechanically secured. 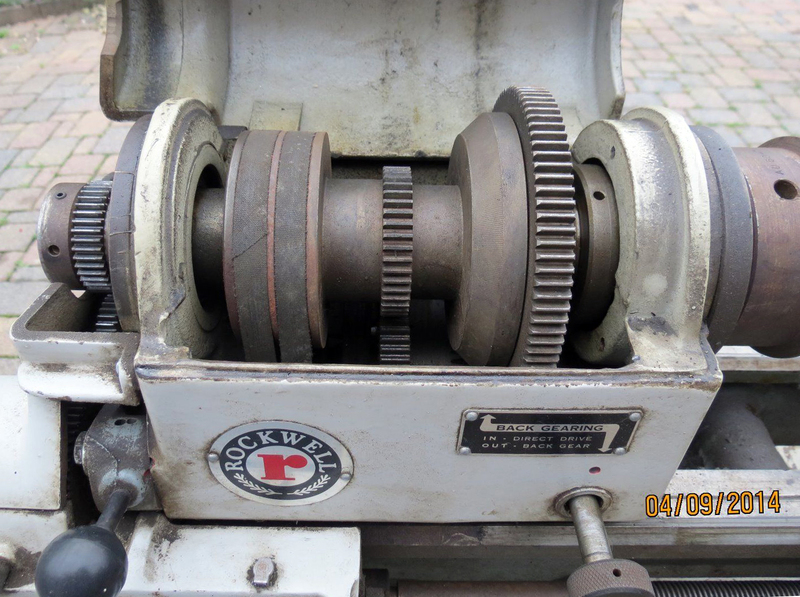 Bench-mounted version of the Delta Rockwell 10-inch with the integral handwheel-controlled variable-speed drive. Note the optional taper-turning unit. Carriage assembly showing over-centre power-feed engagement lever the tension of which could be adjusted as the machine ran. 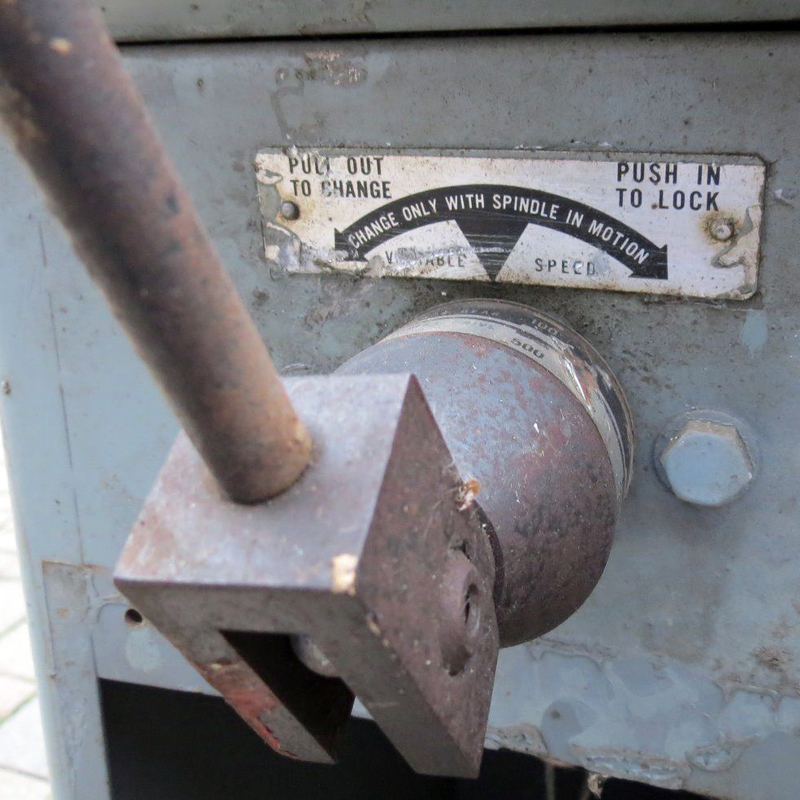 Variable-speed drive unit, 10" bench model. Variable speed drive unit of the underdrive lathe. version intended for mounting on the owner's own stand. Underdrive lathe - variable-speed drive layout.